Companies posted more job openings in April. Now if only they’d fill them. There were 4.5 million jobs available in the U.S. at the end of April, the most since August 2007, the Bureau of Labor Statistics (BLS) reported Tuesday. Job postings are up 16.5 percent over the past year and have more than doubled since their 2009 low. Actual hiring, however, is a different story. Hires were essentially flat in April and are up less than 6 percent over the past year. This has been a persistent pattern in the recovery, as the above chart shows. One reason for the faster rebound in openings is that they fell further during the recession; companies pulled back on posting jobs even more than they did on hiring. But that isn’t the whole story. The ratio of hires to openings, which spiked during the recession, has fallen steadily through the recovery and is now below normal levels. That suggests companies aren’t filling available jobs at their usual pace. It isn’t clear what’s behind that reluctance to hire. Many employers, particularly in industries such as construction, blame a shortage of workers with the necessary skills. Some economists, meanwhile, argue that companies are struggling to fill jobs because there are fewer available workers than the 6.3 percent unemployment rate might suggest. But there’s reason for skepticism about both claims: Wage growth remains anemic (though that may, at last, be changing), which suggests employers aren’t being forced to pay more to attract workers. 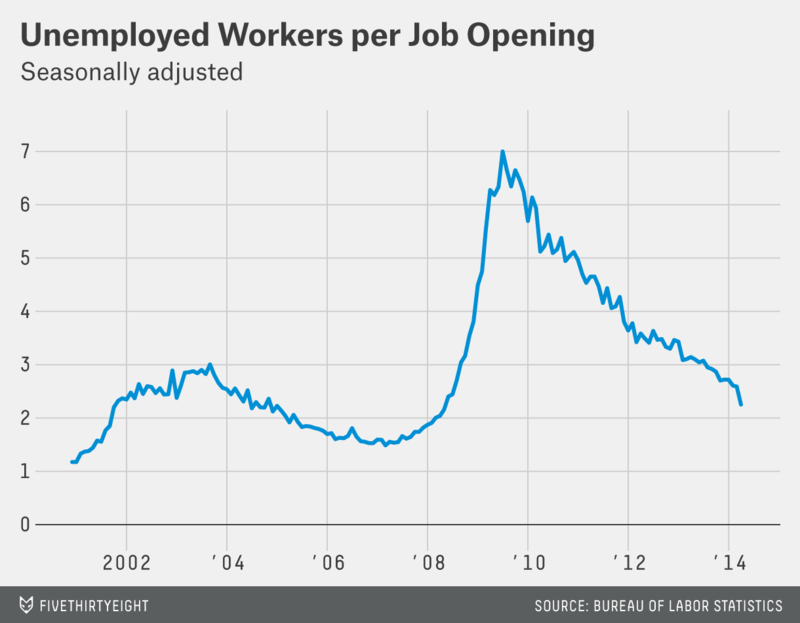 The good news for the unemployed is that more openings means more chances to land a job. There were 2.2 jobseekers for every available position in April, the best ratio since before the recession began. 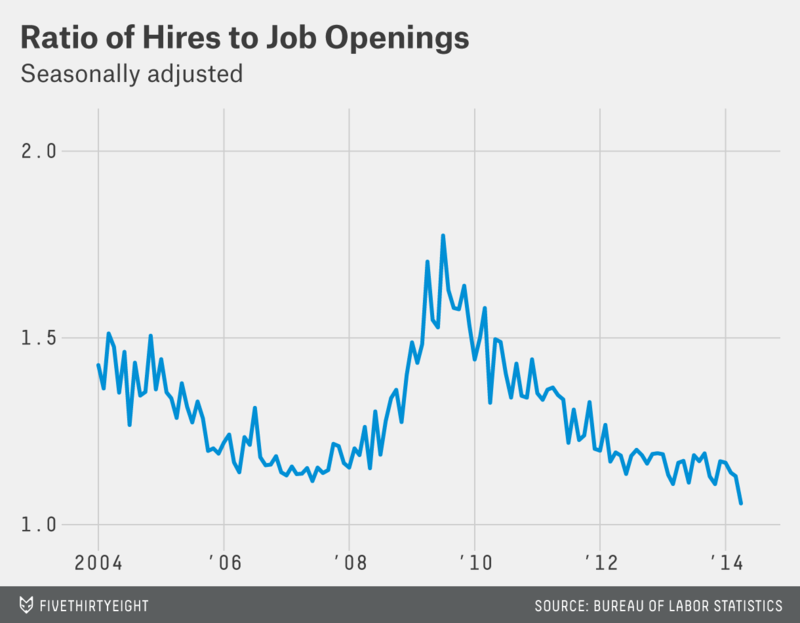 But those openings don’t mean much if companies won’t fill them.